The U.S. and U.K. on Tuesday banned people flying from much of the Middle East and North Africa from carrying laptops, tablets and other large electronic devices in the airplane cabin because of concerns about terrorism. New security restrictions from the Trump administration require nine airlines based in the region to prevent people flying from eight countries from bringing any device bigger than a smartphone on board. Those devices will have to be checked into the luggage hold. The U.S. ban will affect more than 50 flights a day from 10 airports in the mainly Muslim countries, including major hubs such as Dubai and Istanbul, according to senior administration officials. The nine airlines affected were notified of the procedures by the U.S. at 3 a.m. ET Tuesday and must comply within 96 hours. 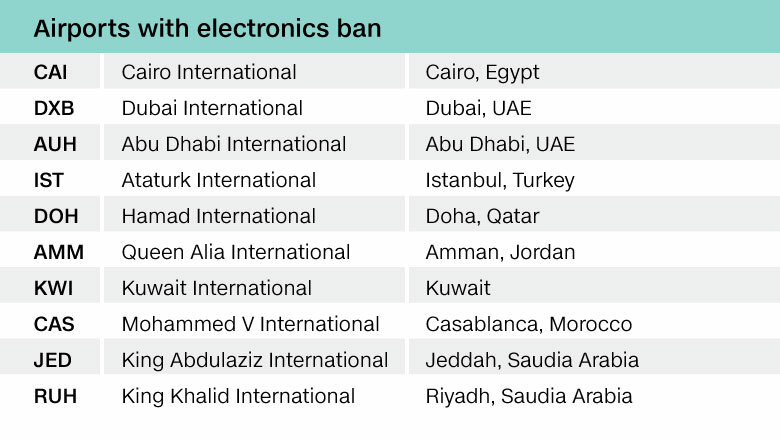 The U.K. ban affects six countries, including two not on the U.S. list -- Tunisia and Lebanon. 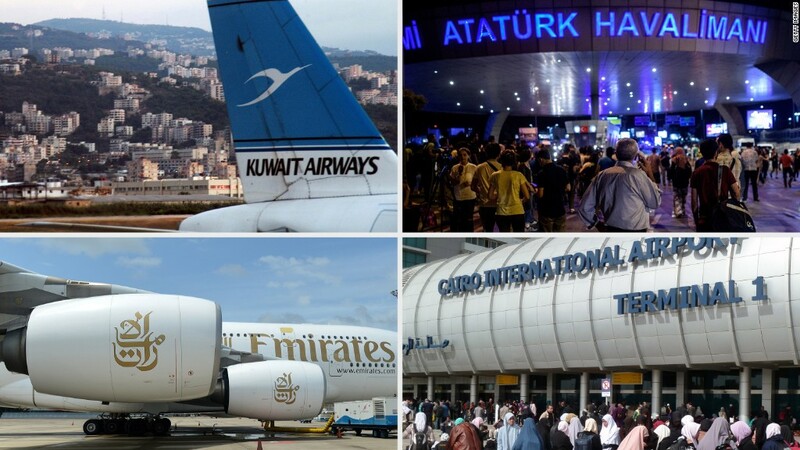 Top international carriers -- such as Emirates Airline, Qatar Airways, British Airways and Turkish Airlines -- are among those that will have to implement new restrictions. The British government said the new security measures were agreed early on Tuesday. "We have been in close touch with the Americans to fully understand their position," it said in a statement. The 10 international airports covered by the U.S. ban are in Cairo, Egypt; Dubai and Abu Dhabi, U.A.E. ; Istanbul, Turkey; Doha, Qatar; Amman, Jordan; Kuwait City; Casablanca, Morocco; and Jeddah and Riyadh, Saudi Arabia. The U.K. restrictions apply to flights from Turkey, Lebanon, Jordan, Egypt, Tunisia and Saudi Arabia on 14 airlines, including some based in Britain. The bans involve some of the widest reaching aviation security measures taken since the terrorist attacks on September 11, 2001. It's a particular concern at these airports because of screening issues and the possibility of terrorists infiltrating the ranks of authorized airport personnel, the official said. Flight and cabin crews are not covered by these new restrictions. -- Rene Marsh, Evan Perez, Deborah Bloom, Barbara Starr and Gregory Wallace contributed to this story.